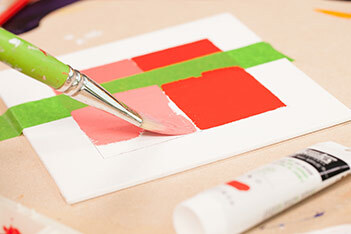 Take the challenge with Liquitex Professional Cadmium Free Acrylic Colours. Specially formulated to mimic the vibrancy of your favourite genuine cadmium colours, Cadmium Free colours bring the same colour strength and opacity to your art. This way you can leave the risk taking to your art, rather than risking your health and choice of materials! Can you tell the difference? Since their establishment in 1955, Liquitex have made it their mission to keep one step ahead of all the latest developments in acrylic painting technology. Although there has been no definitive conclusion on the effects that genuine cadmium paints have on long-term health, Liquitex took a bold step and decided to be the first to offer a parity performance cadmium free acrylic. Both alternatives are offered side-by-side, allowing artists to make the decision based on personal preference. This great new deveopment means that health conscious artists don't have to worry about choosing between their health and their art. These new colours are also fully intermixable with the rest of the Liquitex Professional Acrylics range. Take advantage of the unique intermixability of Liquitex Professional Acrylic paints and mediums, and mix and match your cadmium-free acrylic colours to meet your creative vision! Developed over a period of 3 years, Liquitex Cadmium-Free acrylics deliver the same performance, lightfastness, colour strength and opacity as genuine cadmium colours. A team of Liquitex chemists began their task by evaluating an extensive range of pigments sourced from locations all over the world, which were then put to the test to see which could stand up to their genuine cadmium counterparts. The resulting Cadmium Free range was formed - comprised of seven colours; three yellows, three reds and one orange. Each shade offers the visual and physical performance of a genuine cadmium colour, but without the associated health and environmental risks. 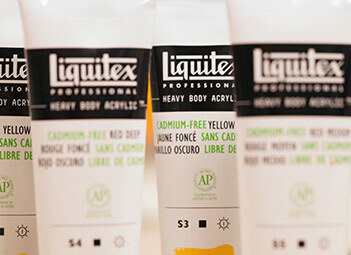 Prior to the launch of their campaign, these new colours were put to the test not only by the Liquitex team, but also by their intended end user: the professional artist. Liquitex selected a group of 41 acrylic painters that were passionate about their cadmium colours, and each were given two seemingly identical sets of colour to test. The artists were not informed of the exact contents of the sets that they received. The first set contained the range as it is currently, with the cadmium colours included. In the second set these paints were replaced with the new cadmium free alternative. No distinguishing marks were given on any of the sets so it was impossible for the artists to know what it was they had received. Placebo sets were also used as part of the testing process; two artists received only cadmium sets and two received only cadmium free. None of the artists could tell apart their sets from any that the other artists had received, although they were informed that placebos were being used. Most artists in the group concluded that they had received a placebo as they could detect no difference between the two sets! Each artist used the paints they had received over a four week period, and were asked to maintain a diary to record their detailed thoughts on the paint, how they had used it and how it performed. At the end of the testing none of the artists were able to tell the difference between the Cadmium and Cadmium Free sets. During these tests not only was mass tone examined, but also reduction with other colours. 'Mass tone' refers to the full strength colour as used straight from the tube. Liquitex carefully examined the colour match when reduced with other colours to ensure that the cadmium-free paints gave the same colour strength and performance when mixed. The paints were also subjected to lightfastness tests under UV light. Three hundred hours in the lab machine is equivalent to 100 year in gallery conditions. Each colour is applied to a strip; one half is exposed to strong UV light and the other is masked. The differences and movements in the exposed area is compared to the masked area. Results are also compared those of genuine cadmium colours. 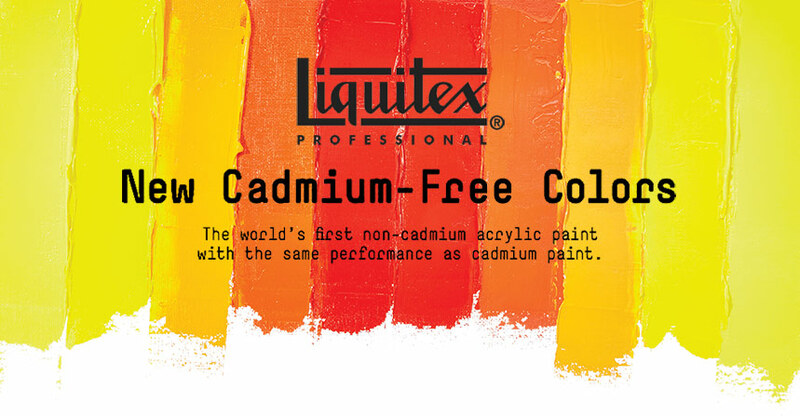 From the results there was clearly no movement in the new cadmium-free colours, which made the chemists at Liquitex completely confident in its longevity. To ensure that this new range was indeed free of any potential harm to health or environment, the paints were submitted to the 'Art and Creative Materials Institute'. The role of the ACMI was to validate that the formulations of the new cadmium-free colours are truly non-hazardous. The Cadmium-Free range passed with flying colours and each tube bears the AP Non-Toxic logo. 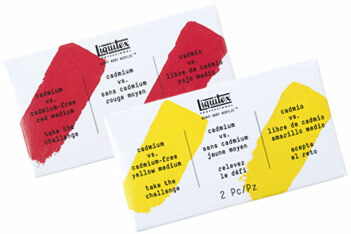 After working on this project for over three years, Liquitex believe that their have finally cracked the cadmium code. But what really matters is what you think. Can you tell the difference? Liquitex want you to experience first hand this true parity performance replacement for cadmium colours. 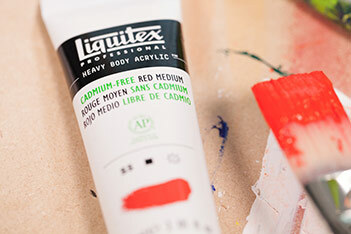 The full Liquitex Cadmium-Free Heavy Body 59ml range is available to buy from our website. With three yellows, three reds and one orange, these vibrant new hues will be an essential on your palette. If you want a little taster of what these new colours are capable of why not add the Liquitex Cadmium-Free sample to your cart with your next order? Each sample set contains two 22ml tubes of either Red Medium or Yellow Medium; one being the genuine cadmium pigment and the other cadmium-free. Try out the samples side by side and see if you can detect the difference between the two. You can share your result on instagram using #LiquitexCadmiumFree and cast your votes on the Liquitex website to say which paint you believe is which!